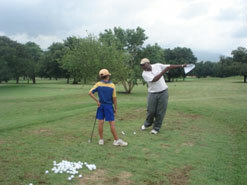 The PGA of South Africa's Grow Golf course is tailor made for the school golf coach. It is based on the PGA's long experience of coaching and educating coaches and uses the Long Term Athlete Development (LTAD) Model as its grounding theory. LTAD has gained much recognition worldwide in recent times as a way of understanding child development and what it takes to become either a world class athlete or a player for life. The PGA SA Grow Golf course both looks at this theory and shows the coach how to present it to pupils. Attendees are also taught about safety and how to plan and evaluate a golf coaching session and are presented with a swing coaching theory that is recognized by PGAs worldwide. The course is 1 ½ days duration and then attendees are required to complete an assignment or pass a practical exam in order to achieve their Grow Golf certification. The courses will take place at Royal Jhb and Kensington golf club and River Club Driving Range in Cape Town and will cost R2000 excl vat. If there are sufficient numbers courses will be run countrywide. SASCOC (The SA Sports Council and Olympic Committee) has laid out the ground rules for the National Coaching Framework and has also adopted LTPD as its coaching philosophy. The PGA Grow Golf course and grow Golf Coaches Association fits with the National Coaching Framework's vision. Graduates of the course are eligible to join the Grow Golf Coaches Association of South Africa. Members of the GGCA qualify for a Grow Golf coaching licence which is renewable annually.